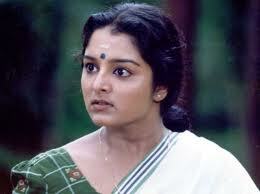 This page has Pictures, Images and Profiles of famous Manju Warrier. To see more Actresses like Manju Warrier click here : Aishwarya, suraiya, ranjani, karishma kapoor, ileana, simran, bhavana, kavya madhavan, madhuri, gopika, navya nair, padmapriya, meera jasmin shakeela, nayanthara, karthika. Born on 1 November 1978 in Kannur, Kerala, to a father whose an accountant and a mother who was a home maker. She has one brother Madhu Warrier, who is also an actor. Her schooling was at Chovva high school and Chinmaya Vidyalaya in Kanuur. Manju certainly strayed from the norm in her house when she showed immense capabilities in dance from a very early age. Manju went on to become bestowed with the title of "Kalathilakam" (A title bestowed to the artist who proves her skills in most artistic fields during a Sub District youth festival) in Kerala youth festival. 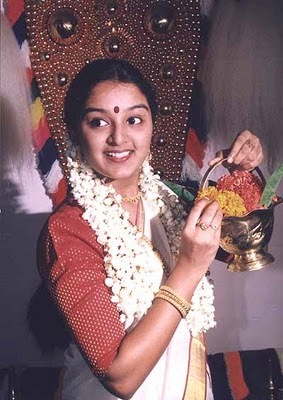 At the tender age of 18 she debuted in a malayalam movie "Salapam" in which she co-starred with Dileep (who many years later she went on to marry) and it was an instant success. This film began her journey into filmdom and the hearts of many Keralities in India and abroad. Her down to earth, girl next door features and realistic portrayal has found her acclaim in the malayalam film world. 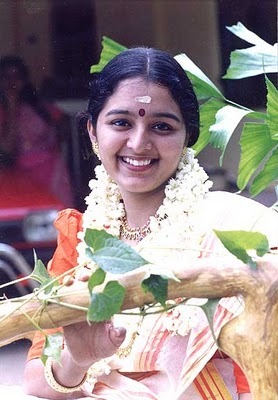 Manju has been hailed as one of the finest actresses to have appeared on the Malayalam screen. Her performance in Kannezhuthi Pottum Thottu won a special mention from the jury for National Awards. Manju, unlike some of her contemporarys, has only ever acted in malayalam films. Manju has over 20 films to her credit, and numerous awards - including six best actress awards in succession from (3 awards in )1996 through to 1999. On 20 October 1998 at Alwaye Sri Krishna Temple, Manju married Dileep - her co star in 3 films - and they have since had a daughter Meenakshi.